The Vision Zero initiative is based on a principle that there is no acceptable number of road fatalities. While we may never have the ability to control instances of human error on our streets, we do have control over how they are designed and the police can control how they are enforced. From New York City to Stockholm, jurisdictions from across the world have embraced the principles of Vision Zero, and have experienced dramatic reductions in road fatalities, despite increasing traffic volumes. Toronto’s Road Safety Plan has not achieved the same results, and I believe we need to admit this fact. I believe it’s failing us. In fact, since Council adopted a Vision Zero Policy in 2015, Toronto has seen an increase in road fatalities, with last year being the highest on record since 2005, and this year at pace to be even higher. The continued trend of traffic related deaths is unacceptable, and a real transformative shift is needed to truly achieve Vision Zero. That’s why I’m pleased there was strong support for my motion to advocate for the implementation of a school safety zone at every school in the city by the end of 2019. This motion is in addition to my previous initiativesto improve traffic safety. These include: accelerating design and reconfiguration of streets, safer speed limits and a request to the Toronto Police Services Board to provide enough resources to adequately enforce the Highway Traffic Act (for example, there are only two traffic cops in the entirety of 53 Division- which is absurd). As your City Councillor, Seniors’ Advocate and a parent of a 5 year-old daughter myself, there is simply no higher priority than to advocate for everything possible to keep our roads safe. Midtown in Focus, City Planning’s detailed vision for the future of Midtown will be presented at Planning and Growth Management Committee on Thursday, July 5th. Please see my letter to the Committee requesting that the Provincial Government authorize the City to put a pause on all condo development until the much needed hard infrastructure and social services are in place to provide the high quality of life that our community deserves. I am writing to request your consideration of the amendment below to help support Midtown residents. Yonge and Eglinton is a vibrant, dynamic area with excellent schools, a growing mix of local shops along with major retailers, and will soon be served by two rapid transit lines with the Crosstown scheduled to be open within three years. The area is also a victim of its own success. In 2006, the Province designated Yonge and Eglinton as a Growth Centre without providing funding to support the mandated population intensification. Local residents know all too well that this imbalance has had significant impacts. Local schools are over capacity, the book you want at the library is out, childcare centres are full, and two or three trains can go by before you have the privilege of being squeezed in like a sardine on the Yonge subway. To help address the issues facing our community, I worked with fellow Midtown Councillors Robinson and Carmichael-Greb in 2015 to initiate the Midtown in Focus review of growth, built form, and infrastructure issues in the Yonge-Eglinton area. After two years of intensive study by our dedicated City Planning Staff, an initial report was produced at the end of 2017 that told Council’s Planning and Growth Management Committee what local residents already know: social services and hard infrastructure have not kept pace with the rapid growth in our community. The initial report validated our anecdotal observations by quantifying the problems we face. This final report allows the City to direct growth instead of developers. This report provides up-to-date policy that recognizes that capital upgrades and expanded social services are necessary to support Midtown residents. While this plan needs to move forward in some form to stop developers from having free reign to build as they have for the past decade, we must build new school capacity, affordable childcare spaces, parks, and other amenities that create a livable community before more development is allowed. Unfortunately, under the provincial Planning Act, the City only has the authority to place ‘holds’ on individual development applications for a specific community benefit. The current rules do not consider the holistic needs of Midtown. We have reached the point where big-ticket projects like a new school and major transit improvements are necessary. Significant infrastructure needs obviously cannot be satisfied by a single developer. That’s why my motion requests the Provincial Government authorize the City to put a pause on all development until the much needed hard infrastructure and social services are in place to provide the high quality of life that our community deserves. 1. Planning & Growth Management Committee requests the Chief Planner to request the changes to the Planning Act required to place an overall pause on development in the Yonge-Eglinton Secondary Plan Area to provide time for the construction of the hard infrastructure and social services needed to serve the existing and projected population in the Plan Area. As many of you know, I have been advocating for a rapid transit plan for Scarborough that will connect more residents through a 24-stop network rather than a 1 subway stop. Throughout this process I have shared my detailed concerns with the veracity of the information being provided to Council on this issue. In July 2016, a briefing note written by the TTC was leaked to CP24 that falsely inflated the cost of the LRT and gave misleading statements regarding how difficult it would be to construct. As a Toronto Star article detailed, this briefing note was used by the Mayor’s office to influence the vote in favour of the 1-stop subway. I went on CBC’s Metro Morning the day the article came out and stated my concerns about the culture of politicization at City Hall using the briefing note as a case study. Andy Byford, Former TTC CEO, took exception to my comments and launched an Integrity Commissioner complaint. The Integrity Commissioner’s report before Council this week found that I had broken Council’s Code of Conduct. While I appreciate and respect the office and the role of the Integrity Commissioner, in this case, she did not provide an accurate portrayal of my actions, omits details that are fundamental to the issues at hand, and asks that I suspend my knowledge of the facts in this matter to avoid penalty. For these reasons I could not accept the findings of the Integrity Commissioner in this matter. Moreover, I will continue to advocate for transit projects that use public dollars wisely to serve the greatest number of Torontonians and speak out when there is need for accountability, even when there are difficult consequences for doing so. For more information, please read my detailed response to the Integrity Commissioner and this Toronto Star article. I am very pleased to announce that my motion to provide $350,000 in local developers’ fees to support the construction of an accessible play space at Brown PS was supported by City Council this week. As you know well, Brown Public School has long been in need of new recreational facilities to serve local students and the wider community. This funding will provide new accessible equipment that will allow children of all abilities to participate, and to be included, in recreational activities with each other. I’ve had the opportunity to help fund other accessible playgrounds throughout Midtown, most recently at Oriole Park and Deer Park, and I believe it’s important that kids of every ability have the opportunity to be included in the life of their school and play with all of their friends. 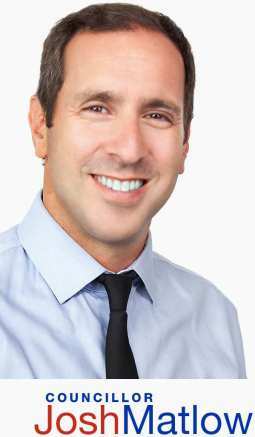 I very much look forward to working closely with Principal Goldfarb, the Brown School Parent Council, Trustee Laskin and local residents to build a wonderful new play space for all of our community’s children. The Bell Boxes Murals Project Comes to Yonge-Eglinton! The Bell Boxes Murals Project is an independent, community-engaged art program of Community Matters Toronto, a non-profit community organization located in the St. James Town neighbourhood of Toronto. The project is an innovative collaboration between private business, community organizations, local artists and local governments that benefits all members of the community. I’m happy to announce that City Council approved my motion to allocate Section 37 funds towards completing nine murals on Bell Boxes in various locations in the Yonge-Eglinton area. Stay tuned and keep your eyes peeled for these creative additions to the neighbourhood! Earlier this month, I was delighted to finally celebrate the opening of our two new midtown parks alongside many friends in the community. 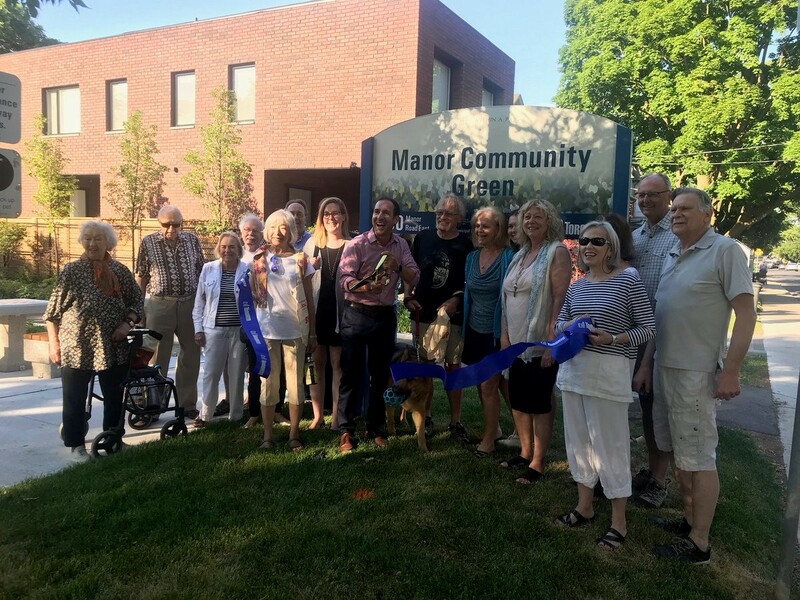 I would like to extend a very special thank you to Manor Road United Church and Mona Piper’s family in their efforts to organize such a beautiful event. 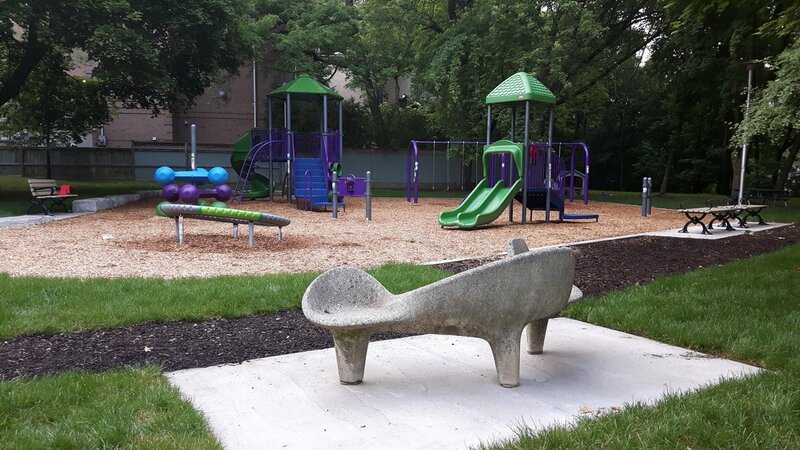 Glen Edyth Drive Parkette Improvements Complete and Ready to Enjoy! 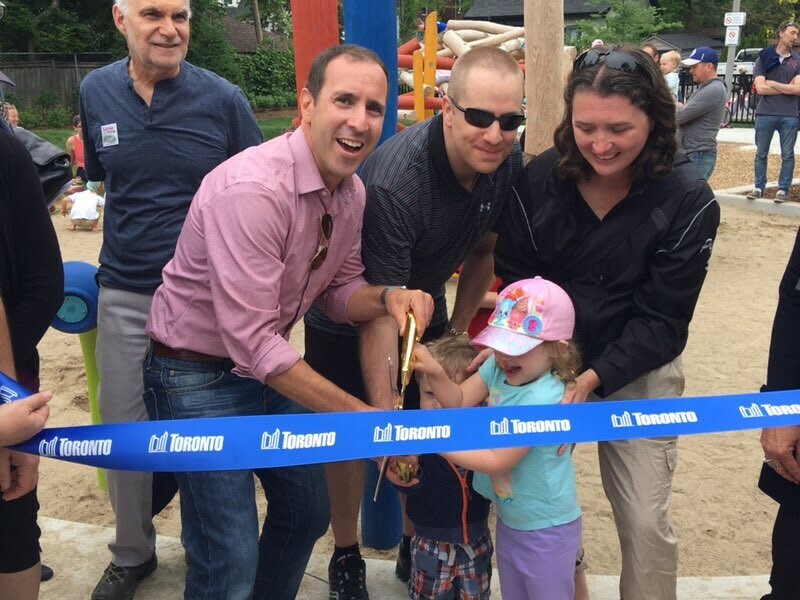 If you happen to be in town for the long weekend, I encourage you and your family to check out the newly improved Glen Edyth Drive Parkette! The new design features two play structures, one junior and one senior, additional seating and landscaping, as well as a new accessible woodchip play surface. Landscaping improvements that provide more shade and seating areas have also been incorporated into the design. Thank you to everyone in the community who contributed their valuable feedback that helped inform the improvements we made to this beautiful green space! On Sunday, July 1st you are invited to join Ward 22’s Member of Parliament, Carolyn Bennett, at her Sunrise Ceremony and annual Canada Day Picnic! The Sunrise Ceremony will be taking place at Wells Hill Park (470 St. Clair Ave. W.) at 5:15am-6:15am and led by Steve Teekens. Festivities for the Canada Day Picnic will also be taking place at Wells Hill Park (470 St. Clair Ave W) from 12:00pm-2:30pm. There will be BBQ, live music, and fun activities for the whole family! Rain or shine, I hope to see you there! Please check-out this poster for more details. I welcome you to join the Bayview Leaside BIA on Saturday July 14th from 10:00am-5:00pm for live music, family entertainment and to support our local businesses! Rain or shine, this event will be taking place on Bayview Avenue, between Davisville Ave. and Soudan Ave. For further details, please check-out this flyer. more. I look forward to seeing you there! Live in Deer Park? Take a quick survey to share your feedback and priorities! If you live in Deer Park, the local Deer Park Residents Group wants to hear from you! With summer almost here and warmer weather on the way, the City of Toronto is reminding residents that they can track their water use online with MyWaterToronto, the City of Toronto’s online water use tool. Use the tool to track your water use by day, week, month or year, to better understand your water use habits and look for ways to save. The tool can also be used to identify prolonged and unexplained water use increases, which can mean you have a leak. You will need your utility bill to sign on to the tool. To learn more and get started, visit this webpage. Transform Community Group is a non-profit organization that is holding their summer leadership program during the entire month of August at Glebe United Church (20 Glebe Road East). Students ages 12-16 will have the opportunity to get involved within the community by creating a community garden, volunteering at a retirement centre, holding community clean-ups, creating art structures out of collected waste and providing the homeless and/or less fortunate with essentials. For those students interested, please feel welcome to check-out this flyer.